Tucked in an area filled with Chinese cuisine, Dining Hall caught my attention on regular basis since I often pass Bandar Menjalara area frequently. The restaurant is a simple no frill one serving up a mix of western cuisine. 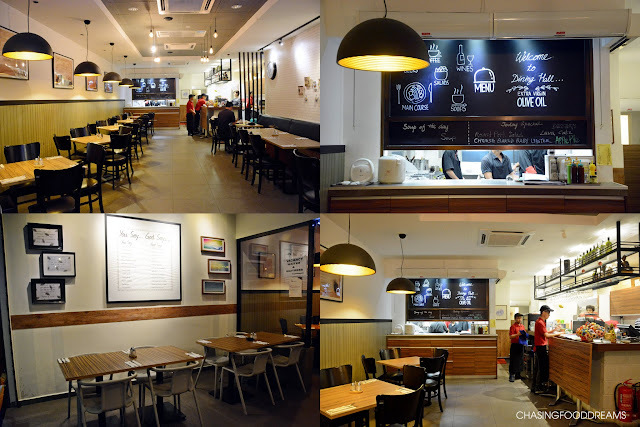 Located in a shop lot in the heavy populated business area of Menjalara, Dining Hall caters to Western cuisine lovers from the menu filled with lots of Western classics from salads, pasta to seafood, pork dishes, steaks and more. They also have a full list of beverages from coffee, juices, smoothies and beer. The restaurant interior is simple and spacious. It is designed with minimal décor and offers diners options to dine in big or small parties. Choose indoor seating or al fresco seating. The restaurant has neat white walls with wood panels on one side and white brick wall on the other side. There are banquette seating and regular seating too. Half globes of yellow lighting are hung over the tables, giving the restaurant a warm and soothing ambience. At the end of the restaurant, one can catch a glimpse of the slight open kitchen space with a big chalkboard showing specials of the day. I have been to Dining Hall before to celebrate my son’s birthday. The restaurant is quite a popular choice for many diners as each time I pass by, there seems to be a good crowd enjoying their meals there. My earlier visit was also a pleasant one and we love their pork chop and pasta dishes a lot. Service was pleasant that day despite the crowd. Our drinks of Hot Honey Lemon (RM7.30) and Japanese Cucumber with Sour Plum (RM9.40) arrived. Since there was a light drizzle that evening, the Hot Honey Lemon was perfect to warm me up while the Japanese Cucumber with Sour Plum was refreshing and lightly savory from the sour plums. We started with Dining Hall Salad (RM17.90), a medley of juicy grilled chicken thigh served with mix greens, radish, cherry tomatoes, konyaku bundles, pine nuts and finished with a plum whole grain mustard dressing. I really enjoyed this salad. The dressing is tangy, lightly sweet and flavourful. Everything worked really well together from the nicely chargrilled chicken thigh to the nuts and even konyaku bundles which added an interesting texture to the salad. Seafood Marinara (RM30.60) proved to be a good choice with its abundance of prawns, mussels, squid and clam meat cooked in homemade tomato sauce. The tomato sauce is surprisingly fresh with a light heat. I would love it to be more robust and tangy but it’s pretty minor as it’s just my preference. The noodles would be better if it was more al dente but the seafood was fresh and yummy. The dish still marked pretty well for its value as it has a good portion of seafood. We also had the Char Grilled Norwegian Salmon Steak (RM34.85) and was pretty happy when we saw a nice portion of the fillet beautifully char grilled. Now I am very picky with fish and have always love my salmon cooked medium. I was happy when this one was cooked to my liking. It was still tender and medium cooked and the teriyaki sauce goes really well with the salmon. The tomato salsa served was average only as I would have preferred something more filling if I were to order this main dish. If you love salmon, make sure to order this as it is very good and cooked to my likings. Grilled Premium Pork Belly Chop (RM38.15 – medium) was definitely the star of the night. I had this before during my son’s birthday celebration and this round was cooked consistently as the last time I had it. The pork belly chop comes in three sizes from small to medium and large so diners can choose the portions to their likings. Obviously it is a signature dish at Dining Hall. The pork belly chop is beautifully grilled with a nice smoky note. It is super delicious, moist, sweet, and tender with a good bite. It is also beautifully layered with fat and lean meat. The pork is served with pepper sauce for extra heat and with mashed potato and apple salad. A Must-order dish at Dining Hall! I like the hearty menu at Dining Hall. Two dining experiences there and I was pleased with both. Food is value for money with its quality and portion. Beverage price is slightly above average though. 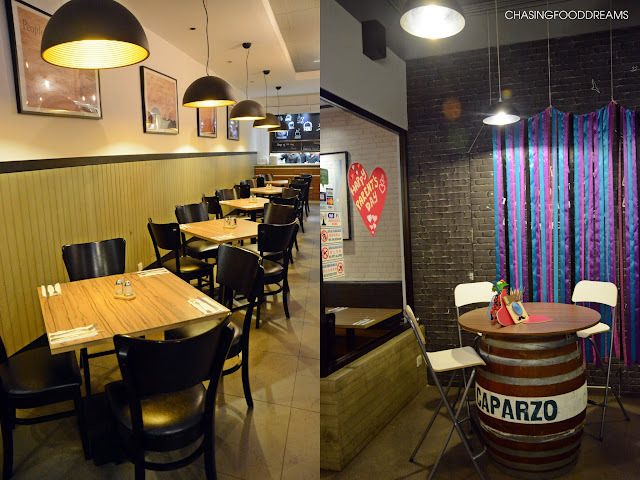 Ambience is simple and casual, perfect for casual dining. I would definitely returned for their Grilled Premium Pork Belly Chop! Book with Offpeak.my! Offpeak.my is an online platform that helps diners save money and time when booking great restaurants online. Once a restaurant is available in the Offpeak.my directory, you can simply book and enjoy unlimited discount on your favorite restaurant, every day, anytime. No more waiting for the right deal or coupon to come by. It’s easy to book and instantly confirmed. Very nice, good food, nice and clean place. Love those barrel tables but dunno if the chairs can stand my weight. Hehehehehe!!!! !